AMW Reports: Benefit Philippines Turns 1 + Giveaway! It was a year ago when I pass by Greenbelt 5 looking at the "Benefit Coming Soon" sign and at the back of my head imagining the things I would buy! Would you believe a year has passed and when you look at my current makeup collection, I've got so much Benefit products! The brand definitely doesn't fail in terms of making ME and my clients happy! When I got an invite to be part of Benefit's First Year Anniversary here in the Philippines last Saturday, I changed my clothes (coming from an early makeup gig) and picked a bright pink top because that's all I can do to brighten up my looks as I'm too lazy to wear any makeup! Because of traffic, I missed the opening remarks hosted by Bianca Valerio but I didn't miss the rest of the party! Shall we? Yummy Red Velvet cupcake with Benefit Products printed on top! Some more pastries that I can't believe I missed having a bite! Gorgeously packed bundles great for Christmas gift-giving! It was super crowded that time but I was able to take a peek at the newest product offering by the brand! This product is said to be the brightening color for both cheeks and lips! Fine One One comes with three shades to LIFT, SHAPE and POP! The product is not available for me to purchase during the event, I was told it would be available locally comes January 2013 for Php1,700.00 (approx $42.50). I was asked by Benefit's Trainer from Singapore Tiffany if I would like to have my brows done at the Benefit Brow Bar. I immediately whispered in Chinese Mandarin if its safe for a pregnant woman and she immediately exclaimed: "OF COURSE!" As I was heading out of the boutique, I was stopped by Tiffany and asked if I would like her to fix some darkness under the eye area and probably moisturize my super dry face (I must've looked like a walking disaster then! hahaha) Who can say no with that offer? And come on! She's a Benefit Trainer from Singapore! I want to learn so much more! Thanks Tiffany for the chat and for the quick, very easy tip on how to moisturize my super dry skin mid-day! Last but not the least, I had to take a picture with this cute Porefessional cart with Benefit Philippines' Brand Manager, Ms. Aubrey Bautista. Before I end this post, I'm sure some of you are excited with the giveaway I was talking about over my Facebook page. Are you ready? 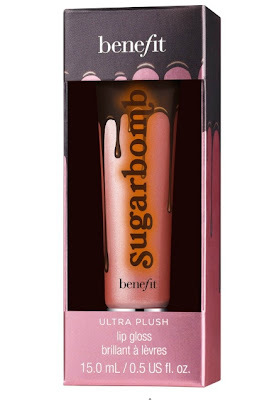 ONE lucky winner will get to try Benefit's Ultra Plush Lip Gloss in Sugarbomb! Is that going to be YOU??? Like Benefit Philippines on Facebook. Answer this question: "What is your first Benefit product?" If you don't own any Benefit product as of the moment, tell me: "Which Benefit product would you like to own?" Contest starts today ends December 31, 2012. 1 Winner will be picked via Fruit Machine. ONE COMMENT per person only. Winner will be announced in this blog post and will be sent an email. Winner must answer within 48 hours or a new winner will be picked. Now, shall I start sprinkling some good luck dusts??? It wouldn't hurt if you share a smile today! I would love to own Benefit's Ultra Plush Lip Gloss in Sugarbomb! perfect for this coming summer a must have in my kikay kit! "What is your first Benefit product?" I have the travel kit for Benetint, Possie tint and High Beam! I had Posie Tint! I was then torn between that and Benetint. But later, I also bought the latter. Hahaha! "What's your first Benefit product?" My first benefit product is "Finding Mr. Bright". and i am so lovin it! Thanks Ms. Nikki! "Which Benefit product would you like to own?" i have never owned any benefit product. but given the chance i would love to have the coralista blush, moonbeam or hello flawless powder foundation. i have read so many good reviews from beauty bloggers and i would be very happy to try it myself. i have never owned any benefit product but given the chance i would love to try coralista blush, moonbeam or hello flawless powder foundation because i have read so many good reviews from various beauty bloggers..
My first Benefit product was They're Real Mascara. Thank you ate nikki! 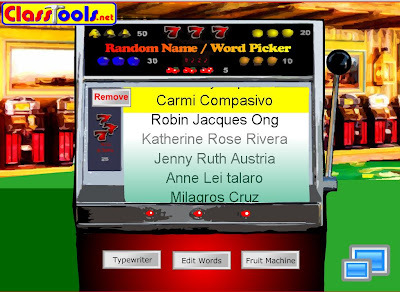 OO nga eh, parang kelan lang ano.. hahaha.. thank you :) excited nako. LDR pa kami until january..
awww pero at least not too far along na lang! tiis tiis lang!!! eeekk so happy pa rin for you! Take care!!! I would love to try porefessional, i heard alot of positive reviews about this product. i would love to own a sugarbomb "sugar rush flush" face powder. I wanted to have the Porefessional since my pores are getting visible coz I'm always exposed to dirt and I have read so many positive feedback about this prduct of Benefit! I don't own any Benefit Product, but I would like to have the Posie Tint, Dandelion Face Powder and Dandelion Ultra Plush Lip Gloss. I love lip and cheek tints and the colors look so refreshing! I would love to own benetint and posie tint because I'm a lip and cheek tint person because of its lasting powers compared to powder blushes. I would also love to own Ultra Plush Lipgloss in Sugar bomb because I never own benefit products. I'd really love to try Benefit's they're real! mascara. wow! I want to get make-over from Benefit too :P You looks beautiful Nikki! I want to try the Dr. Feel Good! I don't own a Benefit product at the moment, but but given the chance, I'd definitely go for the Porefessional. I've read good reviews on this product so I really would like to try it for myself! My first ever kit was Confessions of a Concealaholic (asked a friend to buy it for me from HK) I'm hooked ever since! I don't own any Benefit product because they're too expensive for my meager student budget! If I had the chance to own a Benefit product, I would love to try Benefit's Brow Zings. I have sparse brows and I rely on brow products to make my brows look good! Btw, I am your new fan! Hehe! I would love to own Benetint, erase paste, or POREfessional, hahaha! There's just so much good Benefit products to try! I don't own benefit products because it's not within my budget range.. but I'd love to try their Benetint! Thank you for this achi(^u^) if i can win this ultraplush lipgloss in sugarbomb, it would be my first! its a very chic set! I would love to own Benefit's Porefessional. I do not own any of their products yet but would love to try the Ultra Plush Lip Gloss for a touch of colour since I only have a light touch of make up these days. I don't own any Benefit product yet but I would like to try this newest Fine One One! I would love to own a BENETINT, for it's truly a must-have for every woman regardless of age. Never own a Benefit. Would love to win one. Owning a Ultra Plush Lip Gloss will definitely be a gem. I would love to try Benefit's custom powder cover-up 'cause I already heard good feedbacks about it. I would love to try Benefit's custom cover-up foundation 'cause I already read good feedbacks about it. I don't own any Benefit product yet but I would like to try t Fine One One! I haven't tried any Benefit product. I want to try ultra plush lip gloss. You're a blooming preggers. You only needed an eyebrow retouch then some moisturizer and some concealer and you already looked good to party! Even without makeup you look good! The first Benefit product that I owned was Dandelion boxed face powder. I love it so much that I keep buying it! My first Benefit product I owned was Benetint. I haven't bought any Benefit product and truth be told this is the first time I've heard of it. Thanks for sharing, AMW! Will definitely check out the Fine One One and the Ultra Plush Lip Gloss during the holidays! the first ever Benefit product to grace my dresser is Benefit Benetint. I'd like to have the Benefit Porefessional. I would love the some kinda gorgeous foundation faker! As a college girl, I would want to appear naturally radiant on school days. stay-put primer for concealers & eyeshadows. Perfect for my not so perfect skin. Thank you! I have a Benefit Cha Cha Tint but it's second hand. I would love to try the hello flawless foundation. I don't own any Benefit product yet but I would like to try the Porefessional! I still do not have a product yet but I would like to have the Fine One One as it very compact and convenient to carry. What is your first Benefit product? I'd like to try the Porefessional. I've heard great reviews about this product. P.S. Meron po ba silang store in SM Cebu?